For the last three years or so I’ve been going to a weekly trivia at The Side Quest. At some point early on, I started drawing things (usually related to the team names we chose) for the host of the quiz. Each one of them kept the drawings (as far as I know) and took them with them as they moved on. The newest quizmaster was previously the scorekeeper, so he was aware of this tradition. 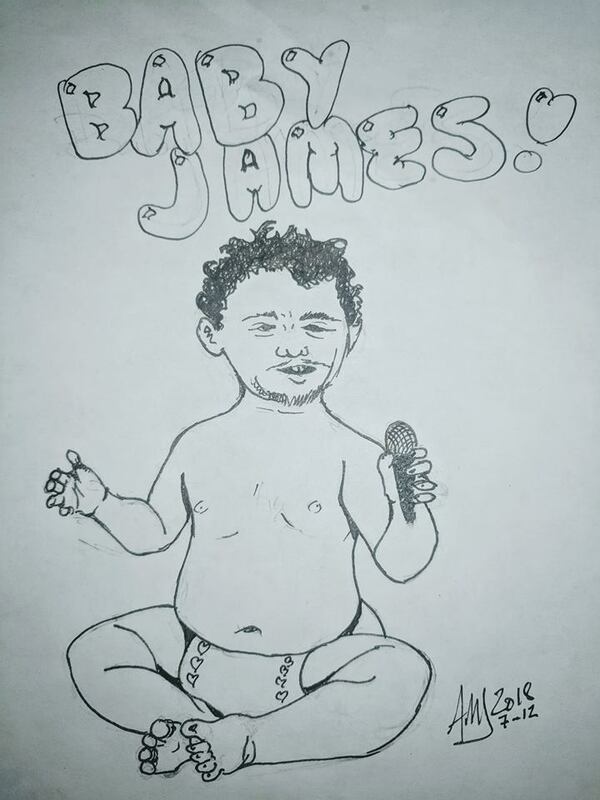 He’d also earned himself the nickname of “Baby James Franco”. This is the first drawing he’s received as quizmaster! 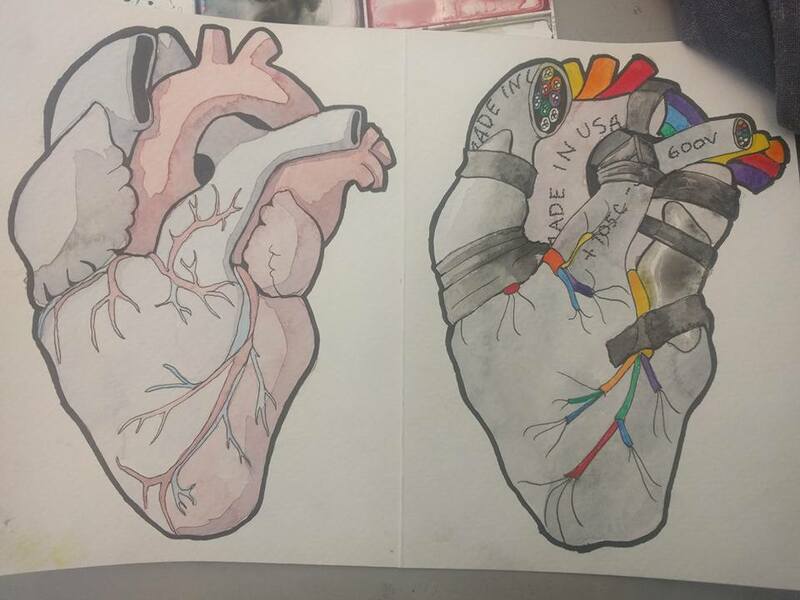 I don’t know why I painted hearts. Jonas says they are a normal heart and a cool heart. I forgot to take a picture of the final shading but it’s not too much different. I’m stuck on one line Maggie Nelson wrote on page 37. This is something that I feared when I became pregnant, when I decided I wanted to have children. I wanted more than one before I had one; but having one has made me realize that, mentally, I cannot handle more than one. And I think it is because of this sentiment I share with Nelson. I cannot be a proper mother while being myself. I don’t think I had that. I think I was still striving to find who I was before I had my child, while I was pregnant, and even after he was born. Women struggle with identity in ways that men will not understand. We have feminists telling us to be ourselves, to make our own decisions, to do what we will, to find our own truth of life. We have the patriarchy telling us to be good and start a family while we can, before complications arise from age, before whatever. Before we’re whole. Be a mother before you’re human. That’s what I struggled with. Be interesting to a partner so that you can get a partner, continue to be interesting to that partner so you can have a child, then be a mom. I think we’ve go too many moms and not enough human mothers. Maybe this is why we’ve got so many depressed women, so many self-medicating under the guise of “wine mom”. The hidden alcoholics. But why judge those that are mothers? There are plenty of moms out there that found their identity in being mom.There’s nothing wrong with that. What’s wrong is if they were never given an option to be anything other than mothers. While I struggle with my identity and with the outside judgments that come from picking an identity, I still am “Mom” My twitch stream is named “Your Mom Plays Games.” Jonas calls me “mom” and I prefer it even though I despise what society associates with the word. I don’t like the other moms on my street sometimes because of how they define “mom” and thus define me. I’m not 100% dead to the world except for caring for my child. I’m not that mom. I can’t be. I’m a human mother. I’m a human. I can hold my child. I can write. While I plan to finish the entirety of I’m With the Bears shortly, I am still on a deadline because this is for a class. I spent yesterday at a relative’s house for a family reunion, in the 94°F (34.4C) heat (“feels like: 100°F” (37.7C) says the weather channel) when outside, in something significantly cooler but still warm indoors. Air conditioners that once made the interiors of houses comfortable can only manage “better than outside” in the summers now. Living in a house without central air has gotten me used to sitting in a room that runs around 80°F (26.6C) as the tiny, single-room AC unit in the window struggles to counter the increasing summer temps. It was James’s side of the family, so the reminiscing was not for me. I hung around with those that married in and we discussed things. The conversation was usually about jobs, status of vehicles, the temperature outside. We talked about how hot it is, how it used to not be that hot, but there was no discussion deeper than that. This wasn’t the time or place for it. It was too hot. My job as an energy engineer/analyst/manager for retail corporations fits snugly into this changing climate. My goal is to save them money by running the AC efficiently. Making stores comfortable so people buy things. On the surface we can tell people that we’re trying to be more environmentally friendly, but it’s all about money. Reading global warming related literature for the last six weeks has got me questioning a few things about myself and my career. Am I helping (by cutting electric/gas/water usage for corporations)? Am I hurting (by making these corporations have a sustainable business that ultimately harms the world)? Should I care about the bigger picture or am I just trying to get by? So many of these novels address and pity those just trying to survive. We’re just one of the masses, dependent on the corporations and the government to keep the world safe for us. We treat them all as too big to fail. And then they do. The perfect ending to this book was Atwood’s contribution, Time Capsule Found on the Dead Planet, in which all the problems of the world are simplified to their core. All nuance of the questions I ask myself are lost the death of the world. What is the point of even questioning what I’m doing if the world is to end? But of course, the point of this collection of stories, as with all dystopic literature, is to hopefully scare people away from the inevitable. “If you don’t care now, here is what will happen!” is sometimes the hamfisted message beat into us from environmentally conscious media. I still remember the shows I was inundated with as a child that desired to make the new generation aware of what was going on. We noticed, but everything else got in the way. 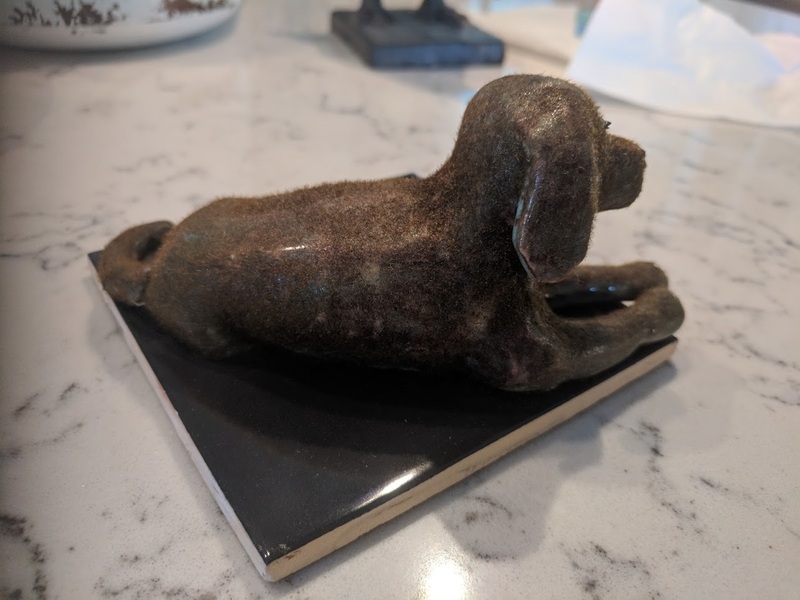 The small scale of the story in The Tamarisk Hunter is a great counter to The Water Knife‘s epic adventure. Everything Lolo did to keep himself where he was mattered so little – he thought he’d be caught and killed for his water related crimes, but in the end they just told him he’s not needed anymore. Those in power don’t need those not, and they can end you in ways you didn’t think possible. Diary of an Interesting Year is a bit like Future Home of the Living God in that it’s written from a single point of view, and one that is of a normal person being affected by the collapsing, panicked government. Unlike Future Home it doesn’t bank on some dodgy sci-fi to explain why they’re running or why pregnancy is horrible. For Cedar, pregnancy becomes a duty, for the author of the Diary, it’s a terrible burden that could lead to death she’s quickly done with. Women become commodities to the strong men. It’s 83°F (28.3C) in this room. 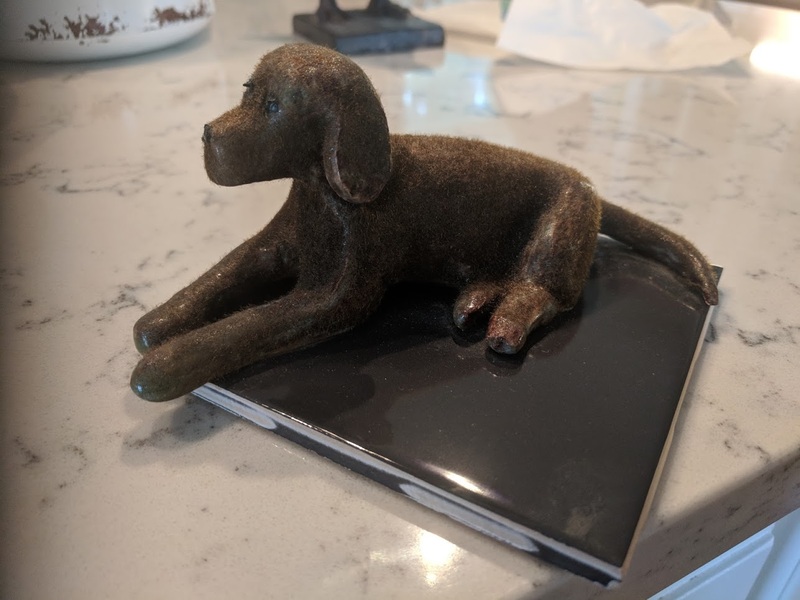 Just like the previously posted Emmett statue, I made a statue of Emma, my father-in-law’s & step-mother-in-law’s pupper. 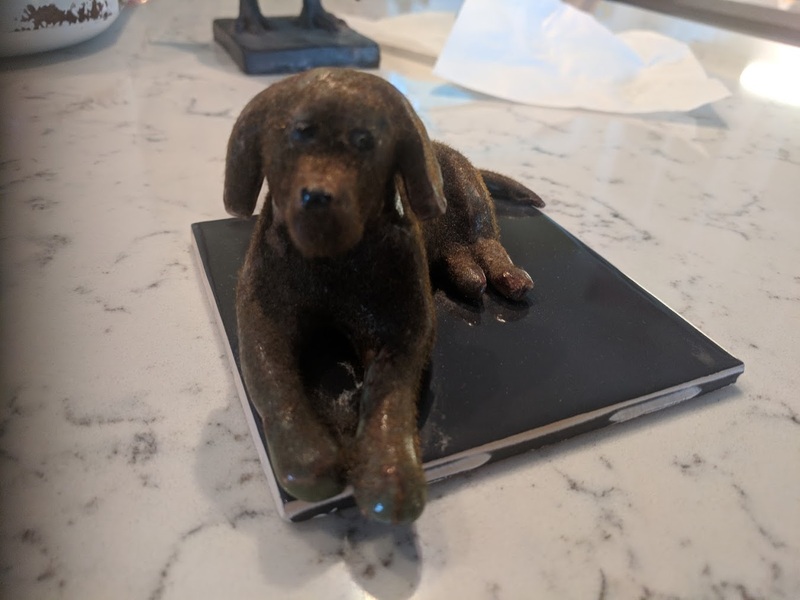 She was a chocolate lab.